During the 2014 Bluemont Fair (September 20-21), this lesson was brought home to children who visited Bluemont's first school and church. Each child received a "Chinker in a Bag." Volunteer Iris Jones had prepared for this by sewing more than 5o small muslin bags. She dyed them with tea and ink-stamped them with the image of the little log Snickersville Academy. 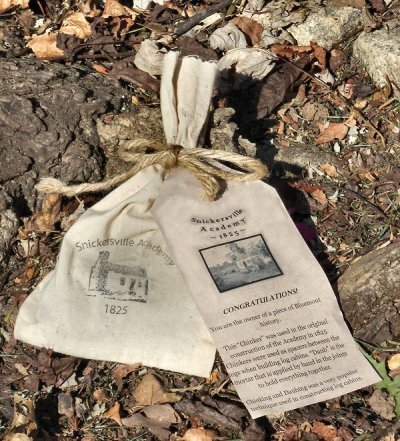 Volunteer Natalie Evancheck designed a tag that announces, "Congratulations-You are the owner of a piece of Bluemont history." This summer Justin LaMountain and Eric Westergard collected, reused, and laid hundreds of chinking stones, securing them neatly in place with an authentic period daub made of sand, lime, and red Virginia clay. They restored all the log wall work originally done by village neighbors during the spring of 1825, slmost two centuries ago. The Snickersville Academy, Bluemont's first school and church now being restored by Friends of Bluemont, has stood almost 190 years. It was used as a church for about a quarter century, remained the only local school for a quarter-century more, and then became a log cabin home to many families for about a century, until the 1970s.